Prolific and prominent architect Rifat Chadirji (1926 - ) launched his office Iraq Consult in Baghdad in the late 1950s. In fewer than twenty years, his design output reached almost 100 buildings, ranging from monuments and private residences to governmental and industrial buildings in Iraq and the Gulf Region. An avid photographer, Chadirji extensively documented his own architectural projects and the shifting image of Baghdad. Despite his fame, in the climate of suspicion that dominated a policed Iraq, Chadirji was jailed in 1978. He was released two years later and eventually left Iraq in 1983 to devote himself to writing and to cataloguing his works. 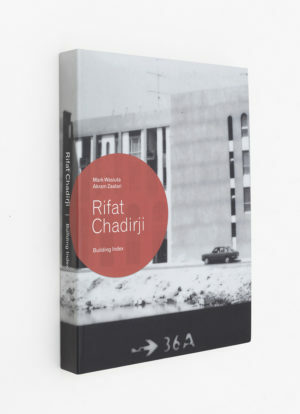 Chadirji’s photographs appear on the sheets that form his building index—published for the first time in this book. The index is both a scrupulous inventory of his building career and a testimony to its sudden end. Akram Zaatari (born 1966 in Lebanon, lives and works in Beirut) has produced more than forty videos, a dozen books, and countless installations of photographic material, all pursuing a range of interconnected themes, subjects, and practices related to excavation, political resistance, the lives of former militants, the legacy of an exhausted left, intimacies among men, the circulation of images in times of war, and the play of tenses inherent to various letters that have been lost, found, buried, discovered, or otherwise delayed in reaching their destinations. Zaatari has played a critical role in developing the formal, intellectual, and institutional infrastructure of Beirut's contemporary art scene. He was one of a handful of young artists who emerged from the delirious but short-lived era of experimentation in Lebanon's television industry, which was radically reorganized after the country's civil war. As a co-founder of the Arab Image Foundation, a groundbreaking, artist-driven organization devoted to the research and study of photography in the region, he has made invaluable and uncompromising contributions to the wider discourse on preservation and archival practice. Mark Wasiuta is an architect, curator, and writer who teaches at GSAPP Columbia University where he is Co-Director of the MS degree program Critical, Curatorial and Conceptual Practices in Architecture. His research exhibitions focus on under-examined practices of the postwar period. Recent projects include “Environmental Communications: Contact High,” “Information Fall-Out: Buckminster Fuller’s World Game,” “Les Levine: Bio-Tech Rehearsals 1967-1973,” and “Control Syntax Songdo.” His work has been shown at the Graham Foundation, the Venice Architecture Biennale, LAXART, Het Nieuwe Instituut, and Storefront for Art and Architecture. He is co-author and co-editor of Dan Graham’s New Jersey and author of numerous articles. His upcoming publications include The Archival Exhibition: A Decade of Research at the Arthur Ross Architecture Gallery, Documentary Remains, and Information Fall-Out: Buckminster Fuller’s World Game.